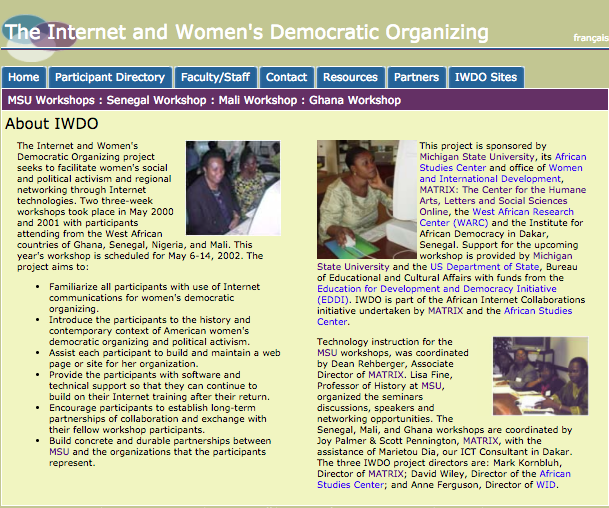 The Internet and Women’s Democratic Organizing was a series of annual workshops centered around building capacity amongst women from the West African countries of Ghana, Senegal, Nigeria, and Mali. The purpose of the workshop was to familiarize the attendees with the possibility of using Internet communications for women’s democratic organizing. Each participant was assisted in creating a website for her organization and learning the technical skills to maintain that site after her return. The workshops also allowed participants to network with one another and share ideas about organizing as women as both a local, national, and international scale.